I once hit the beach at dawn to find a solitary gull there to join me. Although I started to walk in one direction along the water, the bird flew in the opposite direction, so I decided to change my path and follow it. Within minutes, false albacore began breaking the surface close enough to reach with a fly rod. The gull knew more than I did. Even though there was no apparent surface activity at the time, it sensed what was happening underwater. Paying attention to nature’s signals that morning proved rewarding. When it comes to surf structure, a broadened definition that embraces both natural and manmade forms is appropriate. Be aware of anything out of the ordinary along a stretch of beach or backwater area—even a slight bend or depression in a shoreline could be enough to affect your fishing outcome. Some of the more classic forms of fish-attracting and fish-holding areas include boulder fields, channels, cuts, docks, piers, sunken barges, boats and rock piles. One of my most productive flyfishing beach spots is an area with large, scattered concrete blocks that fell from a barge in the 1930s. Hardly anyone knows they are there, except for the town historian. Take your fishing wisdom from any and all sources. 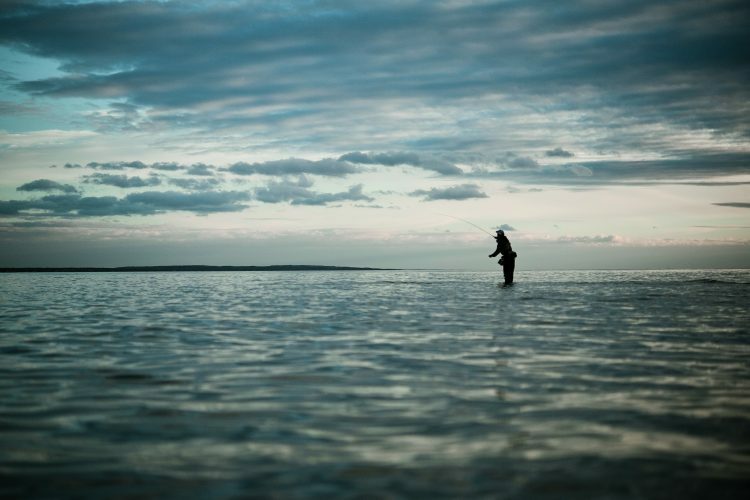 One of the keys to becoming a good surf-and-wade fly-angler is the desire to explore. There will surely be times when you hit the beach to find fish on the move around you, but those situations are often the exception rather than the rule. Hiking, biking, or driving to get to productive areas often works much better than standing in one spot while waiting for fish to turn on. 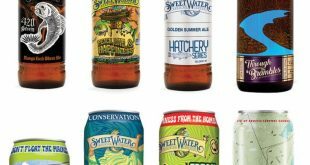 And, when you venture forth to an unfamiliar stretch of beach or backwater, you might discover your own slice of productive water. But, that “walkabout” is not just a serendipitous stroll in the park. The watchful and alert fly-angler is the one who bags the most fish from the beach. Successful surf fly-anglers plan each outing and where they will fish rather than leave the day’s results to happenstance. 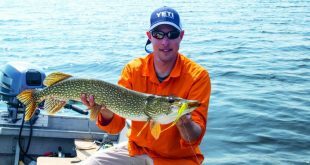 There are many factors that go into preparing a fishing plan, and most of those elements come with experience and acquired knowledge from time on the water … and making your own discoveries. 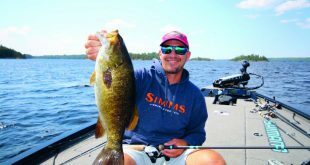 Adapt your fishing strategies and tactics to best suit the conditions, structure, and baitfish. Situations you may encounter include sand and cobble beaches, inlets, jetties, flats, harbors, bays, back country, river mouths, tidal creeks, and salt ponds. Each circumstance presents its own challenges and opportunities. For example, during the early spring and then again during the fall run, beaches that attract sand eels and/or white bait will be the most productive places to fish. Likewise, a favorite wading flat might light up during the transition period between spring and summer. Jetties and inlets could be the ticket to some great late-summer fishing when pelagic visitors like Atlantic bonito and little tunny make their way north. 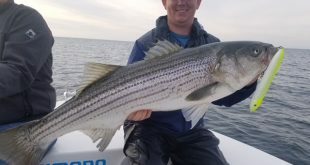 And, fish like striped bass will still venture onto summer flats in many bays along with the cooler water of an incoming tide. The gradient of land masses often holds clues to how the land slopes once it meets and merges with water. On more than one occasion, following sloping terrain led to a hole or depression holding or attracting baitfish well within reach of a fly cast. Extreme low tides are the best times to explore the potential of an area to understand the lay of the land. Time of day is another important consideration, and it is also tied to seasons. Fishing the false dawn period to an hour or so after sunrise and then again during the magic time around dusk and sunset are good rules to follow. The period from about 11 p.m. to 2 a.m. is another great time slot, especially for nocturnal feeding species. Never dismiss fishing during the day if your schedule allows, and this is especially true during the early spring and the fall run. Even high noon can be a great time for spotting and catching migrating fish on sandbars, mud flats, or in the water that touches the shoreline. 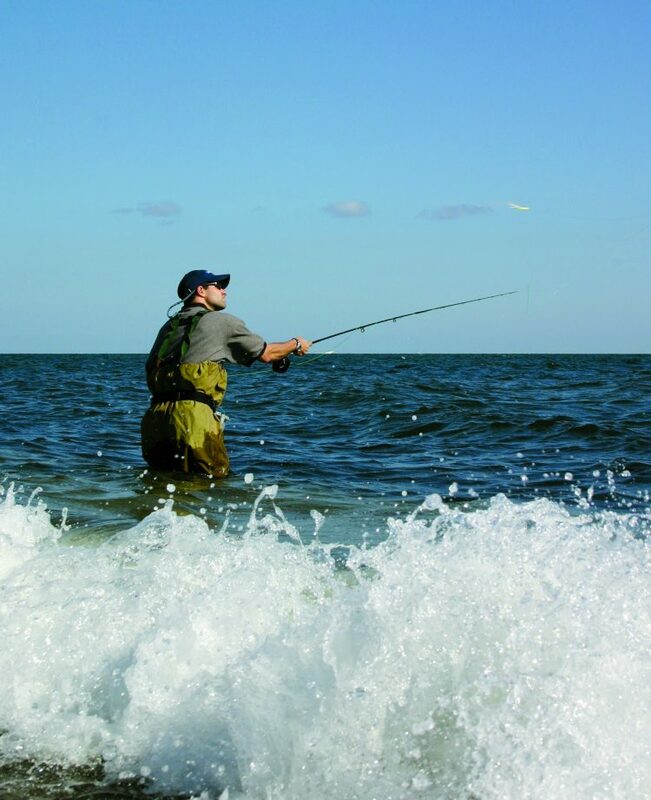 Tidal movements and currents are two of your best allies when fly-fishing the surf. Currents are influenced by the intensity of tides; contour of the coastline; surface and sub-surface structure; rock formations and underwater boulders; channels; troughs; water temperature; and wind. Predatory fish naturally gravitate toward areas of current where vulnerable prey can be ambushed and bait is flushed to them, so look for these kinds of areas within casting range. 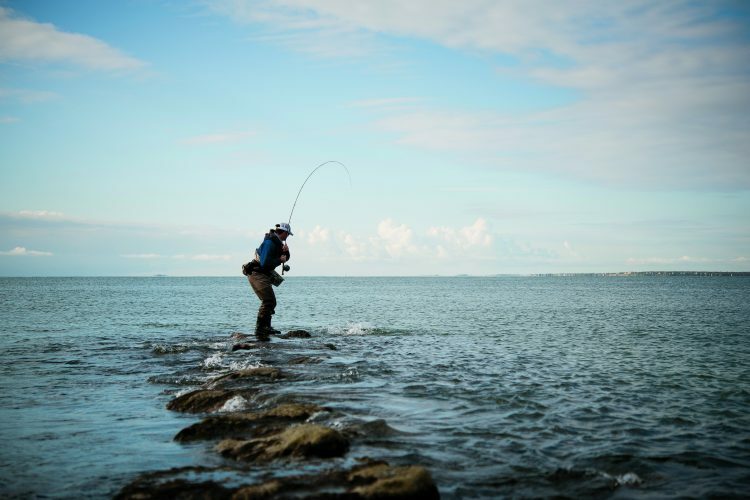 The primary obstacle that those new to fly-fishing the surf must overcome is the fear of casting, especially into the wind. If you have enough hand-eye coordination to hit a beach ball with a tennis racket, you can learn to cast a fly rod in the salty suds. Given that surf conditions and terrain vary, practice casting from different positions. Fish don’t always come at you head-on in the surf, so learn to cast laterally, side-arm and backhand. I know anglers who practice casting on one foot, kneeling, in the water, on rocks, etc. It is kind of like a baseball player practicing pulling the ball, going to the opposite field, or bunting. Be prepared for anything the fish or the weather might throw at you. Wind is often viewed as the number-one nemesis of saltwater fly-anglers, but it can be an ally. Onshore winds will often push baitfish into the surf zone, where predatory fish will follow. 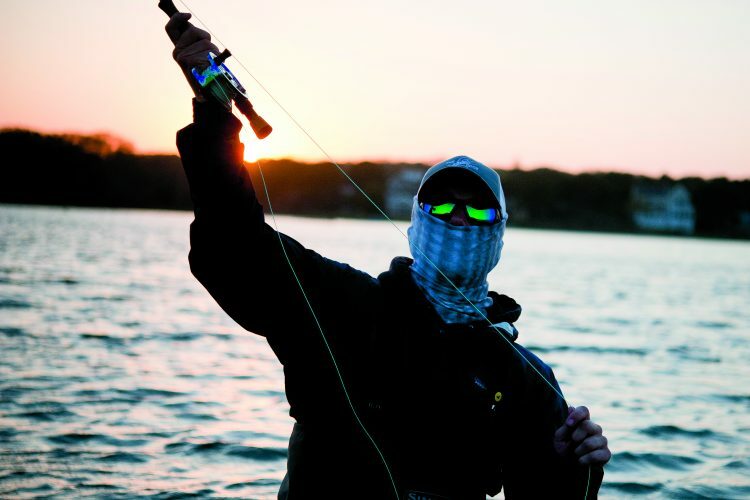 While extreme winds present challenging and overwhelming casting conditions, moderate wind can be a surf-angler’s friend. Don’t shy away from using the fly rod on blustery days. 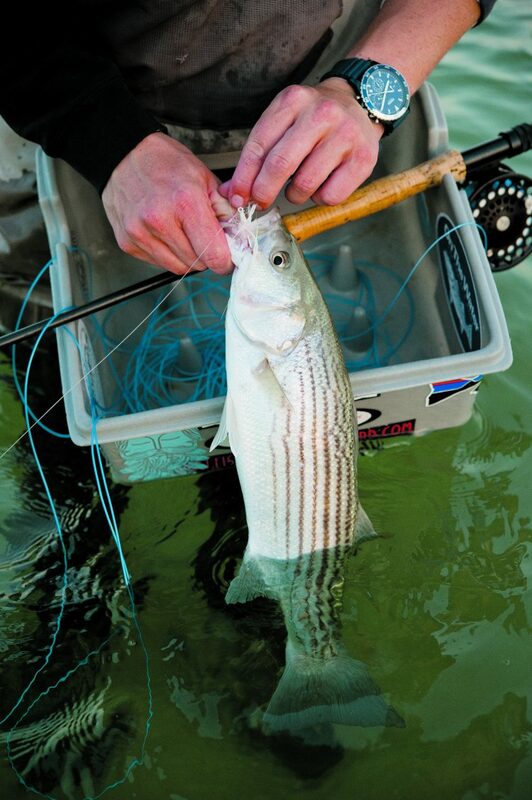 Learn how to cast into a stiff breeze and you will reap fly-fishing benefits many others miss. My best fly rod day ever was in Alaska, catching bright coho salmon nonstop between 40-mile-per-hour gusts with sustained winds over 20 mph. Similar conditions are common along Northeast beaches during the fall. 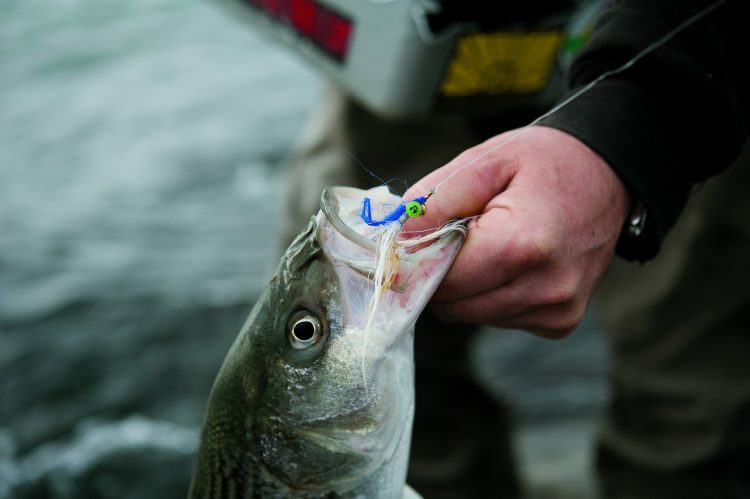 In some of those instances, bass will be right up along the edge of the beach, where short casts can get the job done. Bad things can happen quickly on and around water, so pay attention to the surroundings. Shifting sands from storms may create new hazards and jetties can be especially dangerous. Wade cautiously. Rather than plodding ahead while wading, take it slow. Shuffle your feet laterally as you move, instead of taking big, blind steps. This tactic will help prevent unexpected falls from deeper pockets of water. Additionally, there is nothing more frustrating than being on a beach or an expansive sand flat only to realize you left a critical piece of angling gear back in your vehicle, or at home. If you plan on spending an entire day on the water to take advantage of both tide cycles, pack some extra gear and essentials in a backpack or fanny pack. You might want to bring a lunch, snack and something to drink. You don’t want hunger or thirst to hamper your efforts when the fishing turns on. Like all forms of angling, fly-fishing the surf brings both pleasant surprises and some frustrations. Don’t let the latter dissuade you. Keep at it, and you will enjoy some of the most rewarding times on the water.